Does your dog feel insecure, look nervous or bark out of fear? Is your dog afraid of loud noises? Or when seeing strangers? Or just scared of everything? Or does your dog lose it when you leave the home? Or ... ? Fear and anxiety in dogs comes in many forms. Fear can be related to people, things, sounds, sights, places, and so on. Anxiety from separation is another form, often found in rescued dogs. In response to fear, some dogs sniff the ground nervously, some run or hide, some dogs shake or cower, some pee and poop, some roll over and shut down, and some dogs become very aggressive or even attack and bite—all out of fear. It all depends on the circumstances, severity and triggers a dog has. You can read more on the biology of fear in our article: Understanding Fear and Anxiety in Dogs. Whatever your dogs particular fear triggers may be, living with a fearful dog is just not the same. You want to help your furry friend but progress has been slow and you're not really sure how to help better. By now you may consider resigning to the fact that your dog just is that way. Please don't. We can help you increase your dog's confidence. You will love seeing your dog feel better. Our methodical step-by-step approach goes straight to the root of the issue and helps your dog better deal with stress and all the things that cause fear. 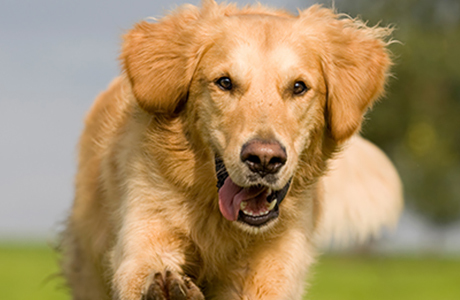 Our approach is based on scientific principles of Affective Neuroscience and helps your dog be more confident in life. We gradually reduce all levels of stress (see The Layered Stress Model) and help your furry family member enjoy life more. The following overview outlines the different program levels in reducing fear. Which program levels apply to your situation, depends on your dog. Our Confidence Builder 1 program is were most fearful dogs start. This program level lays a solid foundation to help build more confidence. These are the building blocks we need to put in place, to be able to help your dog recover. You could compare it to learning the alphabet, before trying to read a book. We also build relevant, basic command skills. We may be able to draw on prior obedience training, depending on how reliable your dog's obedience is. If it is not solid enough for our purposes, we'll fix that. We further begin developing a rewards game for rehabilitation and strengthen the relationship between you and your dog. For about 30-40% of dogs, this program level is sufficient to help them. Our Confidence Builder 2 program builds upon the first level. It further expands the foundation and skills and enhances the game and relationship components. Another 30-40% of dogs need this additional training to reach their full potential. Our Reactivity Reduction program uses Confidence Builder program 1 and 2 as foundation to reduce reactivity in defensive aggressive (aka fear aggressive) dogs. If your dog attacks, charges and bites people out of fear, then this program is necessary to help you. In our experience 20-30% fearful dogs fall into this category. Extreme Fear Pre-Work is not necessary as often; maybe 10-15% of the time. If your dog can't be touched, won't take food from a trainer or has a hard time coming around to even working with us, we must set initial time aside to build trust. This component can seem uneventful at first but extremely fearful dogs need time. This component takes as long as your dog needs but many dogs come around after 4-6 sessions and can move into Confidence Builder 1. One of the key concepts of canine learning in building confidence is: "success breeds more success". Why do police dogs not back down when they apprehend someone? What do they do if a suspect tries to kick them? They don't back down, they take the person down and won't stop until being told to. They built up hardness and resistance because during training they always won. It was consistently made harder for them to win but in the end, they always did. They have learned through success that they can handle anything. Your dog is probably not a police dog but the principle is the same. By succeeding in overcoming a small element of their fear, they learn they can do it. It emboldens them to do it again faster next time and then take on larger and larger challenges as we progress. It takes experience to know how much to push your dog outside its comfort zone to make progress and not push too far to cause setbacks. How we charge for this service: After our initial consultation, we will provide you with a rough estimate on which program components you will need for your dog and how long we think this will take. The program phases are sold as hourly packages with a volume discount off our hourly rates. You pay each program phase as we start it. I.e. if we estimate that you need Confidence Builder 2—meaning your dog is very fearful but not aggressive—you pay for the estimated hour package for Confidence Builder 1, when we begin training and then again for the Confidence Builder 2 package, once we get there. This keeps it fair for all and doesn't financially overburden you at the beginning of the work. If you haven't by now, please review the The Layered Stress Model and read our article on the biology of fear: Understanding Fear and Anxiety in Dogs. to gain a deeper understanding on what is going on in your dogs mind as it pertains to its fearful behavior.